Mizuma Art Gallery is delighted to announce a solo exhibition by Hirofu ISO / Komainu “Nighthopper”. Born in 1978 in Tokyo, Hirofu ISO / Komainu, who studied architecture and fine art at university, creates installation based on the idea triggered by the banal events in everyday life. For this exhibition, Hirofu ISO/Komainu, also known as “Komainu”, attempts to reconstruct such event he encountered during his trip and translate it into the artworks. According to him “the boundary can be contact points as well as a dividing tool. Then, it can also be a place and an event.” The main piece for the show “Days in Nights” has its roots at the boundary and contact point between “day and night”, “city and outer city” and “self and others”. This installation work, which embodies his concept, consists of fluorescent lighting fittings placed in star shape on the ceiling. 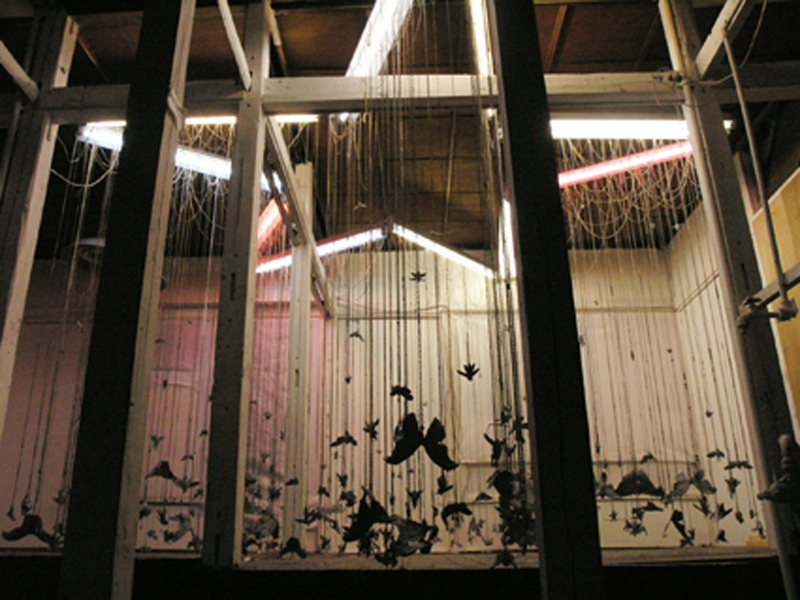 The audience will find painted insects attached to the chains hung from those fittings. Those insects, normally fly under the stars and moonlight at night, are being disturbed by artificial light.Although the human lights are now being existing as “undiscovered” for the insects and stay out of their field, it can be taken into their territory in the course of time. A large scaled lambda print work “Land” is another element of the show. 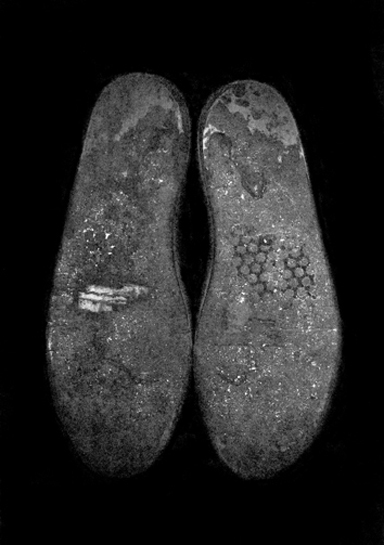 The artist initially photocopied the soles of his worn out sneakers, then enlarged it to his life size, 177.5 cm high. As if it reflects the place and the event he ever encountered, the black and white image gradually turning into an aerial picture of the earth to our eyes. Although we wear a pair of shoes everyday, the soles remain the part of “unaware”, and then everyone put them off as it towards the end of the day. All those elements made the piece very personal. As the insects are not familiar with artificial light, human beings who live under daylight cannot exert fully in the darkness of night. Hirofu ISO / Komainu is attracted to unknown and unconscious part of the world, which can be translated into “night” in this show, and pursues his interest like cutting a path through the forest. The exhibition title “nighthoopper” can signify the artist himself and while expanding his territory, the unknown become well known and the border between him and the object shifts. 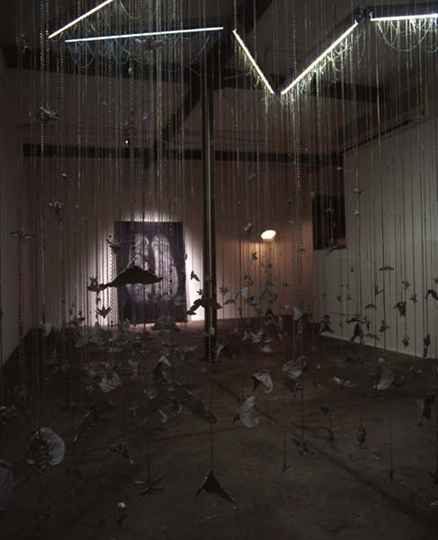 This whole event is concentrated in and embodied as his installation work.